Two identical spherical masses M and M initially at rest at very large separation start to move towards each other under their mutual gravitational attraction. Assume that there are no other appreciable fields to affect their motion. (a) Show that their relative velocity of approach when they are a distance r apart is √(4GM/r) where G is the gravitational constant. (b) What is the velocity of the centre of mass of this two mass system? 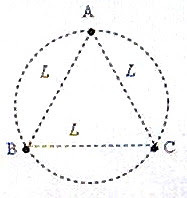 (d) If there are three identical masses A, B and C (instead of two) forming a ternary star system with the masses at the vertices of an equilateral triangle of side L and revolving along a circular orbit circumscribing the triangle as shown in the figure, calculate the orbital velocity of each star. [Many ternary star systems have been observed using modern telescopes; but, three identical stars with equal separation arranged on the same circle is rare]. (e) What is the gravitational field at the centroid of the triangle? Justify your answer. As promised, here is a model answer for your benefit. (a) Since the masses are initially at rest and are separated by a very large distance, their kinetic energy as well as potential energy is zero. When they start moving towards each other, their kinetic energy increase at the cost of their potential energy which becomes more and more negative. When the separation is r, the kinetic energy of the system is ½ MV2 + ½ MV2 = MV2 where V is the magnitude of the velocity of each mass. (Their velocities are V and –V since they are moving towards each other). – GMM/r + MV2 = 0 [Total energy is always zero since initially it is zero and there are no external forces]. From the above equation, V = √(GM/r). The relative velocity of approach is V– (–V) = 2V = √(4GM/r). (b) The centre of mass of a system can be affected by external forces only. The gravitational attraction between the two masses is an internal force and hence the initial velocity of the centre of mass will be retained. Since the two masses are initially at rest, the centre of mass also is initially at rest. Even though the two masses move towards each other because of the gravitational attraction between them, the velocity of the centre of mass will be zero. (c) The gravitational attractive force between the masses is GM2/(2r0)2 = GM2/4r02. Therefore, the orbital velocity V = √(GM/4r0). (d) Each mass experiences two forces of equal magnitude F = GM2/L2 because of the gravitational pull by the other two masses. The angle between these forces is 60º so that the net force is √(F 2 + F 2 + 2 FF cos 60º) = F ×√3 = (GM2/L2)×√3. R = (2/3)L sin60º = L/√3 (Note that the circumcentre coincides with the centroid in the case of equilateral triangle). (GM2/L2)×√3 = MV2/R = MV2/( L/√3). From this V = √(GM/L). (e) The gravitational field at the centroid of the triangle is the force on unit mass. But the three equal masses A, B and C exert forces of the same magnitude with angle 120º between their lines of action so that the net force on unit mass placed at the centroid is zero. So, the field is zero.